George (short for Georgina) is staying with her aunt and uncle after her brother went missing. They are eccentric and the house is odd. Her uncle is kidnapped and she sets out to find him. She recieves help from two orphaned boys and a talking map, and she travels through many magical places. The characters are great and this was a fun read! Twelve-year-old George has no idea what to expect when she’s sent to stay with eccentric relatives following the disappearance of her brother. Soon after her arrival, she learns that Uncle Constantine has been kidnapped. George sets off to recover him and is joined by two orphaned boys along the way and Cavendish, a talking map. Together they visit magical worlds full of monsters, witches, and dragons as they attempt to find Constantine--the Timekeeper--a man of great significance. If he’s not rescued, events will cease to happen at their designated times, disrupting the unfolding of the universe. Can this ragtag crew save the future before being outwitted by evil captors? McKenna Ruebush grew up all over the world. She has wandered through rain forests, driven from Canada to Guatemala, and moved to Europe twice to work as an au pair. She currently lives in rural Idaho with her feline minions. 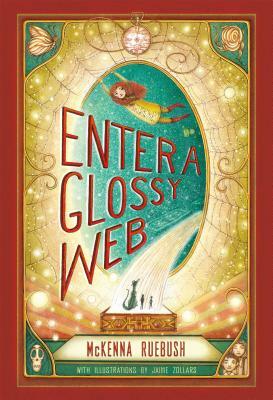 Enter a Glossy Web marks her debut.